Changing our appearance has always been a vital part of the human need to express our identity. Different clothes, hairstyles, makeup and changes in hair color have been a part of our culture for several millennia. While some may perceive changes in looks as superficial and unnecessary, the fact we’re so persistent at expressing ourselves through our look speaks to a deeper reason behind it; something other than “I just want to look nice”. One of the basic human needs is the need to be understood. We search for understanding primarily by using body movements and language in order to successfully communicate with others. However, there are more subtle ways in which we can communicate some more elusive parts of our personalities. We do that by merging the symbolism behind different colors and patterns and the ideas they represent with our own physical appearance. Everyone knows about the famous breakup cliché and hair change: after we go through a stressful period in our lives, both men and women tend to change their hair. It’s really easy to attribute this behavior to vanity, but it’s much more likely that people change their haircut and hair color in order to communicate that they have been through a life-changing experience and that they’re not the person they were before it. And the best way to communicate that subtle change in character is to make changes to the hair. Now, hair salons are no cheap venture, and people often use the store bought box hair dye and hair dye brush in hopes of achieving salon-worthy results. Sometimes, those efforts turn out to be a success, but in most cases, they end up with a hair appointment and regret over the outcome (hello, orange-yellow hair that should have been beachy blonde!). Most people tend to attribute the home-coloring fails to the quality of the hair dye, and they’re not wrong. But what most people don’t realize is that hairdressers use not only professional hair dyes, but professional hair color brushes as well. We all tend to use the dye brush that comes in the box color package, which is almost always low-quality, flimsy, slippery, and looks like it was washed ashore after only one use. That’s why we’ve made this buying guide where you can find hair coloring brush reviews, our top picks for best hair color brushes, interesting hair color brush information, as well as tips and tricks on how to use them. Enjoy! A classic, an evergreen and a best seller, all in one product. There isn’t one (and we mean it – not one) dissatisfied customer of the fantastic 5-star Framar Power Painter brush! It is lauded by hair coloring professionals and amateurs alike as an all-around hair dye brush that is easy to handle and lasts for a very long time. The reason Framar made it is to keep up with the latest trends in the industry – specifically the balayage trend that has taken over runways and the rest of the world by storm, in recent years. 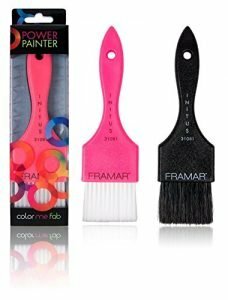 Unlike regular hair dying brushes, which pick up too much product, because their purpose is to cover all of the hair, instead of blending it, The Framar Power Painter picks up just enough product and diffuses it perfectly throughout the hair strands. It is wide, allowing for faster color distribution to bigger surfaces, which is key to achieving a successful and well-balanced balayage. This brush comes in a set of two, a black one and a pink one, which is really helpful if you’re going for two-tone highlights. It’s built to last, incredibly sturdy, and even if it ends up covered in hair dye, the ergonomic handle makes it easy to maneuver so it doesn’t slip out of your hand. Customers are unanimous in claims that this brush is a joy to work with, it makes blending and hair painting a breeze and is an ideal choice not only for balayage, but for creating lowlights, high-contrast weaving (feathering), and a “baby light” effect without weaving. The AccuSoft bristles are the company’s staple, and they are 3 times denser compared to a regular brush, and they are flexible enough so that the color transitions are soft and imperceptible. One of the best things about Framar Variety set is that you can actually get high-quality, professional hair color brushes on a budget. The brushes come in a set of three, with different bristle widths and handle functions, so you can achieve any coloring style you like and really get your money’s worth out of these. All three brushes feature AccuSoft bristles that are soft enough to make blending easy, while also being stiff enough to apply the color evenly. The brushes come with tapered edges which guarantee high precision and ease of detailed application. The extra wide brush is exactly what the name says: extra, extra wide, making it perfect for fast root touch-ups, without any precision lost during the application. The second dye brush in the set is the classic Framar brush that can be used for most color applications. The third and the last one of the bunch is a multifunctional medium-sized brush with a metal pin tail that enables effortless parting and sectioning of the hair. Together, these brushes are all you need to foil, tone, balayage, highlight (and lowlight), blend, feather and color melt. This type of variety would be enough for them to be our top pick, but the Framar Power Painter prevailed because of the same quality bristles, but 3 times the density! The Framar Variety set allows for precision color placement, reduce product waste and because of the perfect balance of softness and stiffness of the bristles, they won’t pull on your hair and will deposit even a very thick, pasty color mixture evenly to your hair. On the flip side, in the hair coloring brush reviews, a few consumers reported that the bristles frayed a tiny bit even before the brushes were used, but they also stayed the same throughout the use, without fraying further. One user noted that their extra wide brush formed a serrated edge and wasn’t exactly top-notch quality, but nevertheless, they were satisfied with their purchase. 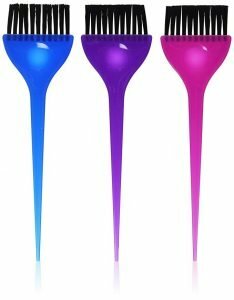 These Soft ‘N Style trendy-looking translucent set of three hair dye brushes are extremely practical for people who are on a budget. The brushes come in three different colors as well: blue, pink and violet, which makes it really easy to achieve a nuanced, tonal look, with up to three different hair colors, without having to rinse the brushes in between. The bristles are made out of synthetic fibers, which are softer than most plastic bristles out there, especially in this price range, but aren’t up to par with the Framar AccuSoft bristles. The bristles are easy to wash and rinse every last trace of the hair dye, so there’s no problem in using them over and over again. The Soft ‘N Style brushes are not professional hair color brushes, nor are they the fanciest ones on the market, but they will get the job done. They are good for applying hair color to specific strands because they’re not too wide, but they are also great for dying your whole hair, as long as it’s not too long or too thick. The length of the bristles and the handle allows you to apply dye or bleach to some hard-to-reach areas of your hair, making this a really great product for a DIY professional-looking hair coloring. The length of the handle makes it useful in sectioning the hair and flipping the strands, as well as stirring bleach or hair dye if need be. However, the handle does come with a downside: due to its length, it bends easily after a few uses. Also, the bristles can start to bend and pull on the hair after being used a few times, especially with bleach. But on the other hand – there are three same brushes in this set, which means that they’ll last you for a long time, regardless of a slightly lower quality compared to our top two picks. This is a great one-size-fits-all option for those who don’t like to make a fuss about their hair coloring. 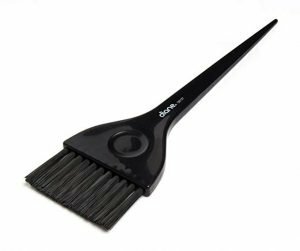 The handle of the Diane hair color brush is sturdy and durable, and its large size makes it easy to cover a lot of hair, fast, as well as touch up roots when in a hurry. At their widest, the bristles are 2.5 inches and are made out of black nylon, which makes them effortless to clean. The handle is great for sectioning the hair and it won’t bend or break under the weight of the hair sections. The bristles are on the stiffer side, so until you work them in a bit, it will be a bit harder to evenly distribute the hair color. However, at a price that’s below $4, this brush will do a good job out of coloring your hair, after you get used to it. Some customers even reported using it to distribute hair treatments, conditioners, and coconut oil onto their hair and were more than satisfied with the results. The Mudder hair dye brush kit consists of 5 same-sized brushes, which can come in handy if you’re planning on trying a wild, rainbow-colored style, or if you prefer to have an extra brush to apply hair color available at all times. These silver grey hair tint brushes are best for personal use at home because they run a bit too small for salon needs, where time is of the essence. While the white nylon bristles are too narrow to some, they do contribute to the overall precision these brushes have to offer. 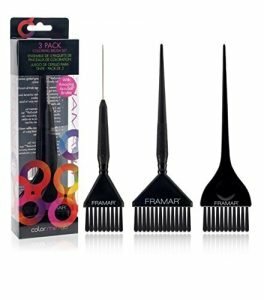 The tapered handle is made out of plastic and has a comfortable grip, making it easy to section hair. The plastic material isn’t of the highest quality, but these brushes aren’t at all about being the best in the market. They are a good deal, and the price to quality ratio is satisfactory, provided you don’t have a thick or long hair. The bristles won’t pull on your hair and get it stuck in them, making the coloring experience neat and enjoyable. Most customers state that they are satisfied with the performance of the brushes. Furthermore, the bristles don’t shed, either, which is a remarkable achievement, considering their price that rings at around $7. The downside to these brushes is that they are not as easy to clean as some others that we’ve mentioned, and that’s due to the combination of tightly packed bristles that are on the stiffer side and the nylon material. At exactly the same price as the Mudder brushes, the Invisibles come in a 3-pack. If we would have to choose an affordable brush to apply hair color that would be ideal for a coloring beginner, we’d choose this one. Unlike with many other brushes, the bristles on this semi-transparent brush (it isn’t completely transparent as advertised) aren’t soft and they don’t want to be. They are sturdy for a reason, and that is to cater to the needs of people with textured or thick hair. The bristles are also pretty wide (around 2.25 inches to be exact), which makes them ideal for root touch-ups. They are stylish as well and will make for a pleasing aesthetics if you also have a transparent hair dye bowl and need the brush to match it. The brushes are extremely easy to clean and with a bit of shampoo and lukewarm water, they will recover even from dyes that have stayed on them for a day or two (hey, it happens, right?). The dip in the plastic handle makes it comfortable to hold, and the plastic doesn’t feel cheap and is solid enough to make this purchase one that will last. One major downside that makes this brush tricky for professional use is precisely the sturdiness of the handle. While it is solid, its tip is also too wide to be able to section hair with ease, so it really isn’t convenient to use in hair salons. The Colortrak brushes come in a pack of three and at their price at around $5, they also pack a punch! They feature stiff, angled (rounded) bristles that don’t fall off or fray, and are suitable for dying thick hair. Although one customer didn’t agree with this statement, a lot of others did, and at this price point, it’s not that important if it turns out that your hair is indeed too thick for these bristles. The bristles are wide, so they might not be ideal for doing highlights on small strands, but with a little practice, they could be used for a balayage. They can be reused many times and are easily washable. If you like to feel a bit fancy, travel a lot, or don’t dye your hair on a regular basis, you’ll be glad to know that each brush comes with a clear plastic cap that covers the bristles. Made for applying highlights and relaxers, the Silicone Dye Brush 6-pack includes 2 small, medium and large brushes. One of their main selling points is that they are the fastest and the easiest to clean up out of all other brushes. Just take off the silicone applicator, rinse it out and let it air-dry. Also, because there’s no product wasted by getting stuck in the bristles, the silicone one is the best hair dye brush in the cost-efficiency department. Annie silicone brushes all come in different widths, ranging from less than an inch to an inch and a half. However, a lot of hairstylists refuse to use it, because the product tends to fall off the sprush applicators often, and the brush can’t deposit the product evenly on longer and thicker hair or individual strands. These brushes are excellent for putting on hair conditioner using broad strokes, and they really shine when people with short and/or thin hair need coloring. It all comes down to your specific needs and hair type. For all nifty people out there, these silicone hair dye brushes can also be used in the kitchen, for craft painting, and other creative hobbies. Similarly to the 6-pack Annie silicone brushes, these are also used for applying highlights and relaxers, and they make a perfect mixing tool. As any silicone brush, they are very easy to clean up. These brushes come in a pack of two medium-sized brushes, with one being a flat brush, while the other one has ‘teeth’ or faux-bristle ending for easier application. They are effective for root touch-ups and depositing thicker hair dyes and conditioners. While the silicon color is pretty, expect it to wash off and become all-black after a few uses. 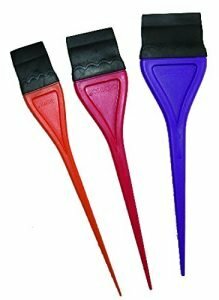 These rubber color applicators come in a set of 3, which are all differently sized: 1, 1.5 and 2 inches. They are chemical resistant, soft, and flexible – ideal for applying hair relaxer. It will simplify the process of applying relaxer and make you forget about the wooden stick that usually comes in the kit. 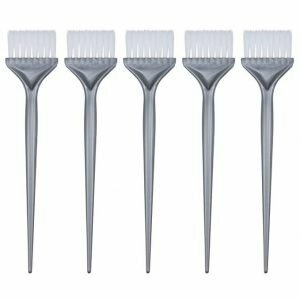 Similarly to the silicone brushes, these are capable of applying more than enough product without the bristles absorbing the majority of it. However, their ends aren’t completely flat – they have a small crease which tends to hold some product in it, but even so, they save you time and money. One additional advantage is they don’t cause any stress or hair-pulling, making them good to use on clients with sensitive scalps. Hair dye brushes are like cooking knives: everyone has probably used one at least once in their lifetime, but only when you use a sharp cooking knife do you realize how important it is to invest in a high-quality one, which will make your life so much easier. The best hair color brushes were usually used in hair salons by professional hair stylists and were one of their little secrets to a hair dying job that would be hard to mimic at home. As the online market started to develop, and as more and more information about beauty and cosmetology started to make their way on the internet, good high-quality brushes were made available to a broader public, and at an affordable price, too! With all the amazing hair coloring tutorials available on YouTube, and the rising prices of going to a beauty salon, more and more people decide on trying out those coloring techniques at home. In order to achieve the desired result, you have to have a good starting base, starting from the quality hair dye, but also the brushes and the accompanying things needed to make hair coloring at home as easy as possible. Design-wise, hair dye brushes tend to be minimalistic and practical. After all, their main and (almost) only purpose is to dye the hair. However, depending on your bathroom layout, or the salon aesthetics, it’s sometimes equally as important to get pretty-looking hair dye brushes in order to make them fit into the overall look of the place. That’s why there are all the different options, ranging from transparent to wooden brushes. But we’ll talk more about that below. When choosing the best hair dye brush for yourself or your salon, try to think of a particular coloring style you need the brush for and the hair type that you (or your customer) have, and start from there. If you’re unsure as to what brush you’re looking for, it’s best to read up on some hair coloring brush reviews and see what other people think of each particular brush. Before deciding on buying the hair dye brush, let’s take a look at some key parts that every hair dye brush has. Hair tint brushes are really simple-looking. There are only three main components to them, with a little bit of variation thrown in. The brush handle is considered to be next to no importance by inexperienced hair colorist, but the truth is that its quality decides on whether you’ll be able to use the bristles and actually apply hair color properly. The handle needs to be firm and sturdy, which is why it’s mostly made of wood, solid plastic or metal. The length of the handle is important as well, because the longer it is, the flimsier your hand gets at color application because it’s hard to control the strokes. On the other hand, the handle shouldn’t be too short, because then it would be hard to use it to separate hair. Speaking of hair separation, it’s best that the handle be thin at the top so that you can actually use it to separate delicate strands of hair. This is easiest to achieve when the handle is made out of thin metal. A wide continuation of the handle, the grip is a wider piece of material that’s used for gripping (shocking, we know) the brush firmly while applying the color. The more comfortable the grip, the lesser the change of you getting hand spasms due to the unnatural positioning of the hand. Try to find a brush with a wide grip that also has a dip in which to place the tip of your finger. It’s a detail, but it’ll make a world of a difference, especially if you’re a professional hair colorist. The applicator is what decides the function of every hair dye brush. There are two main types of applicators: bristles and spatulas or sprush applicators. The bristles can be made out of nylon, plastic, synthetic fibers, and horsehair, while the sprush applicators are made out of rubber or silicone, and are usually detachable in order to make cleaning them as easy as possible. Now that we know the basic parts of hair dye brushes, let’s address all the different factors that play a role when choosing the best hair color brushes for your needs. Depending on what you need the brush for, how much you’re willing to pay for it and whether you’d like it to be able to separate the hair, there are three main options to consider. Wooden handles are the most elegant and the sturdiest. They will last you a lifetime and will never break. However, they are usually the most expensive ones to get. They look really professional and elegant in a salon but are often not ideal for hair sectioning. The handles made of metal usually have a metal pin tail, actually. It’s a really thin piece of metal that is used for sectioning the hair. In order to provide comfort while using these brushes, they usually come with a wider grip. They are a must for any salon, but if you’re looking to buy just one dye brush for home use, opt for one with a sturdier and more practical handle. These are the most usual handles on the market and they often bring the best of both worlds. They can be especially sturdy and also have a sharp tip. They are cheap, and as long as they are quality made, this is the best option for a home DIY coloring. Fire pits really do come in almost every material imaginable, so we’ll try to point out the good and the bad in all main materials. Bristles are a classical type of applicator and are a favorite to hairdressers everywhere. While they do tend to absorb some of the product, they also allow for a more controlled application and are necessary in order to blend hair color properly. As mentioned, they can be made out of different materials, the most common one being nylon. The best bristles for varied use are made of synthetic fibers, and some companies like Framar Brushes even make their own type of bristles (AccuSoft), which are the best in the market. Bristles can be long or short, and both have their benefits. Long bristles give a softer overall look and are able to apply hair color to some hard-to-reach places, while short bristles make root touch-ups easy and increase stroke precision. Stiff bristles: Best for thick, textured hair, because they have enough power and sturdiness to work the product deep into the hair. On the downside, they’re not as effective at creating a nuanced color transition, they can pull on the hair a little bit, and irritate the scalp (although this is rare). Soft bristles: Ideal for creating soft highlights, blending, feathering and balayage. They are great at coloring individual strands, but they lack exactly what stiff bristles offer: penetrating power with thick hair. Sprushes are celebrated because they are product-saving champions! They don’t hold any product in and they are great for touching-up the roots, coloring the whole hair and applying other products such as conditioner. However a lot of hair coloring brush reviews agree upon sprushes being useful only if the hair dye is thick and pasty; otherwise, it will most likely fall of the silicone/rubber sprush. Depending on whether you need the hair color brush for highlighting, balayage, or coloring the entire hair, there are different shapes available for each individual purpose. There are rounded and tapered bristles, which allow for a greater precision in highlighting thin pieces of hair, while flat ones are other used for hair coloring in general and root touch-ups. Additionally, there are angled applicators for ultra-precision, but those are most often seen in a hair salon because most people don’t know how to use them or don’t have the patience to. The wider the applicator, the less precise it is; that’s the general rule of thumb. They can be 3 inches wide, but on the other hand, there are some applicators that are so tiny they can’t fit onto a brush handle but resemble a mascara wand more than anything. If you’re after a ‘universal’ hair color brush, aim for 1-2 inch width. As we’ve said earlier, there are a lot of different materials, and hence a number of different looks to hair dye brushes. Depending on whether you’re buying one or a set of brushes, for personal use or a salon, each brush style has its own appeal. The most elegant ones are the wooden ones, but you can play around with transparent or semi-transparent brushes that give off a clean and minimal kind of look. There are also some really quirky and fun patterned hair dye brushes around that would fit amazingly into some edgier hair salons that are known for experimenting with hair colors and haircuts. The plastic ones (high-quality plastic) give off the impression of a professional, straightforward and reliable hair salon, which is visited not because of its looks, but because of its results. Even the best hair color brushes on the market cost under $20 or less. If you’re buying a brush or a set of brushes for personal use, that investment will probably set you back less than $10. Given these amazing prices, home coloring is becoming prevalent nowadays, and with good reason. With good tools and information out there, the perfect hair color is just a matter of practice. You may have seen the new trend emerging and some infomercials promoting battery-operated hair coloring brushes that have a color dispenser and work just like a regular brush does; only they color your hair in the process. Well, while that is a tempting idea, those brushes aren’t effective and don’t disperse the equal amount of dye to your hair. Maybe in time people will figure out a way to make them effective, but we wouldn’t recommend getting one just yet. If you have a sprush applicator hair dye brush that you don’t use, try using it as a kitchen spatula, or as a painting tool. They’re fun and can be used in a lot of arts and crafts! At the very least, you can use it to evenly apply hair conditioner, hair mask or plain old coconut oil to your hair. Expert tip: The best hair dye brush is sometimes right in front of you! The fastest (although a bit risky) way to get a subtle balayage is to actually apply the dye to your regular hair brush that you use every day! Apply the 2-nuances lighter hair dye to the upper third of the hairbrush and run it through from the middle of your hair down to the roots. Repeat until all of your hair is loosely covered with hair dye. The results will be more subtle than if you used a hair dye brush and the application will take 15 minutes, or even less! It’s no secret that hair dye could stain our hairline and refuse to come off for days. Fortunately, that small mishap can be easily prevented by applying some Vaseline to the skin surrounding the hairline. What most people forget when coloring their hair are the ears. Well, now there’s a solution for hair dye stained ears as well, and it comes in the form of silicone ear covers! They might seem a bit unnecessary, but if you have short hair, they sound like a good investment after all. Fun fact! If you can’t separate your hair strands because your brush handle is too thick, and you don’t have a hair comb either, try using a pencil! Hair dyes have immense staining power, so it0s not the best idea to use a kitchen bowl to hold the dye. Instead, consider getting a color bowl and brush at once! You can even play around with the idea of getting color-coded bowls and brushes, especially if you plan on using more than one color on your hair. Also, if you’re into balayage, but can’t be bothered with using foil to keep the color from transferring onto other hair strands while applying the dye, consider getting a balayage board and brush kit. It’ll make your life so much easier! The most important thing when using a hair dye brush is to clean it regularly, especially if you have a bristle applicator. It will significantly prolong its lifetime and effectiveness. 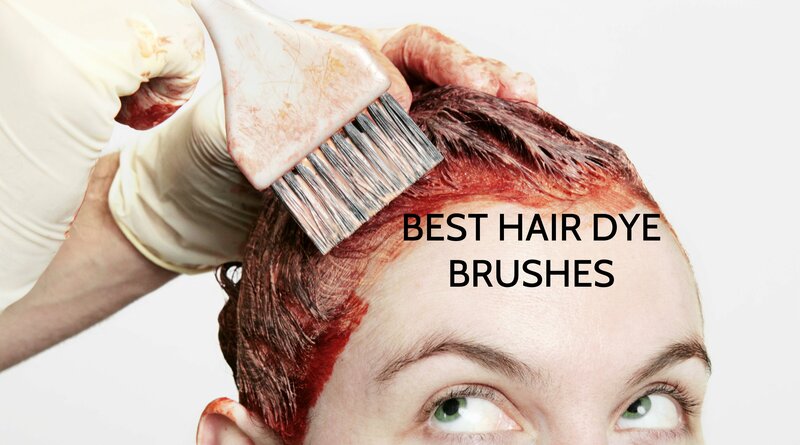 However, if you noticed that the bristles frayed too much and spread he hair dye to areas you don’t want to color, it’s time for getting a new set of brushes. There isn’t a lot of information about how to pick the best hair dye brush for your needs and what to look for. We hope we’ve helped at least one enthusiastic DIY balayage artist out there to pick the right hair color brush! Our top three picks are the amazing Framar Power Painter and Variety Color Set, which are ideal for balayage and most other coloring techniques, and the reliable Soft ‘N Style translucent brush for all-around coloring enjoyment.